It goes without saying that one has to be super fit to make it as a Navy SEALs. The SEALs are an elite group of folks who train for the most demanding tasks some of us can’t even imagine. These folks have to train hard to get their body ready for challenging missions. You may not have what it takes to become a SEAL but you can always follow their fitness program. Navy SEAL Fitness provides you with over 800 pages of content on how to push your body and get it fit. 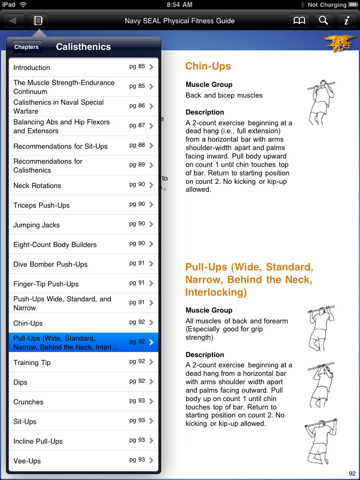 Navy SEAL Fitness is essentially an enhanced fitness e-book for iPad. Some of these workouts are quite challenging, which is not a surprise considering what the SEALs have to prepare themselves for. This guide covers running, swimming, strength-building, flexibility, and other workouts. It provides you with enough background information to better understand your workouts. 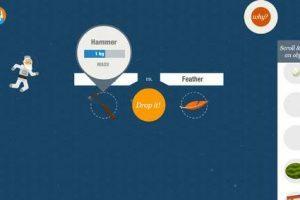 Navy SEAL Fitness provides you with instructions and illustrations so you can do each move correctly. 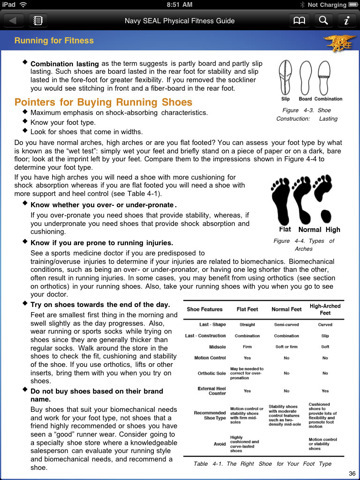 It covers techniques, injuries, and other useful information on fitness. Navy SEAL Fitness won’t make you a SEAL but it does gives you enough information to push your body very hard. We would love to see more interactive content added to this app though.